I am in the process of writing a book about the Nevada Northern Railway and the Nevada Northern Railway Museum to be titled Where Steam Moved Mountains published by Stanford University Press. The book is to be a combination history/photography book. The following article was developed in the course of writing the book and a version on this article will appear in the book. This is a kind of advance book tease. For more information see the various newsletters in the newsletter section of this site. I welcome your comments about this article. Did I get it right? Did I miss anything? Was it easy to understand? Was it engaging to read? The steam locomotive smoke box, what is it and what does it do. As the most prominent part of the locomotive's boiler, the front segment of it if you will, it is the part that you comes at you, it is the face of the machine. It's cylindrical in shape and makes up about 20 percent of the boiler's length. There's a round door on the front, held tightly closed with a series of metal latches around the perimeter. That means that there must be something inside, but what? While writing the book, #40's boiler was due for being brought into compliance with the new FRA Form 4 regulations and had to have its tubes and flues renewed. The author made a number of trips to Ely while this work was being done and photographed the locomotive at various stages of the process. On the last of these trips it was hoped that the work would already be complete and it would be possible to photograph the locomotive in operation. That was not to be, instead, final assembly work was in progress and it was possible to photograph the inside of the smoke box as its various components were being installed. Now, back to our original question. But first, to answer this we need to look at how the boiler works and what it does as the smoke box is an integral part of that. A steam locomotive is an external combustion engine, the fire does not take place in the cylinders, but rather, in the firebox of the boiler. The boiler makes steam and the pressure of the steam drives the pistons. 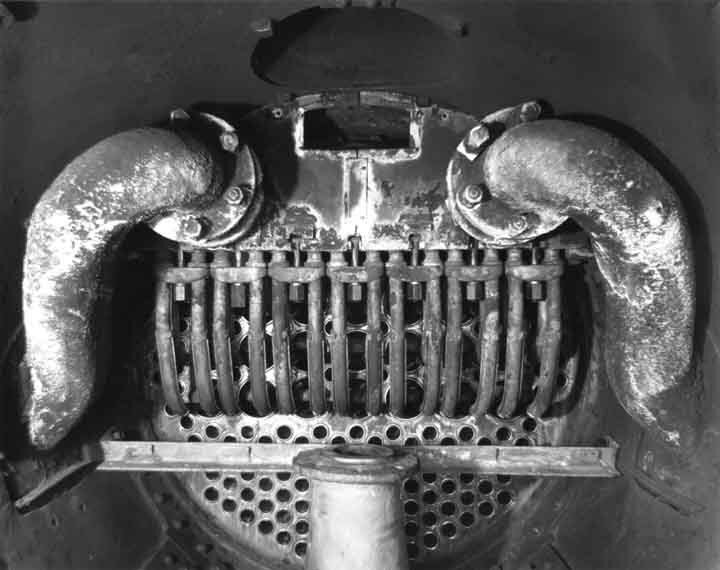 Locomotives use what is known as a fire tube boiler that sits horizontally along the locomotive's frame. It's the single biggest part of the machine and makes up much of the locomotives bulk. The firebox is one of the three sections of the boiler, it's at the rear of the locomotive, partly in the locomotive's cab. The smoke box is the section at the other end. Linking these are the main boiler courses with the fire tubes. These tubes link the firebox and smoke box. Hot gases from the fire pass through the tubes to the smoke box which is an open chamber. From the smoke box this gas or exhaust goes up the smoke stack, stack for short. Heat from the fire in the firebox and the exhaust gases in the tubes heats and boils the water in the boiler. Sounds simple enough, but what draws the gas through the tubes and drives it out the stack? Now it starts to get interesting as a draft must be created to draw the gases through the boiler and indeed to draw air into the firebox. This is the primary job that is done in the smoke box. The exhaust steam from the cylinders is used to create the draft. How it does this is rather ingenious, the steam, which still has some considerable pressure behind it, is not just injected into the smoke box, that would create pressure in the smoke box and that is what you don't want. Instead the pressure of the steam is used to impart a velocity to it and this velocity carries it up the stack and draws the atmosphere in the smoke box with it, crating a vacuum. This vacuum creates the draft. To get this to work the steam is directed within the smoke box by the blast pipe which stands up from the bottom on the smoke box. The steam passes only a short distance through the smoke box before it enters the petticoat pipe, so named because of its shape and how it hangs from the from the stack above. In fact it is really an internal extension of the external smoke stack. As the steam passes between the two pipes, friction and turbulence draws the exhaust gases with it. The interesting thing about all this is that the harder the locomotive is worked, the greater the volume of steam blasting through the smoke box, the stronger the draft and the hotter the fire. But there is much more going on inside the smoke box. The exhaust gases do not take a direct route from the tubes to the stack. Instead a series of baffle plates directs it through a circuitous route to assist in getting the ash and cinders in the smoke to fall out and not go up the stack and out to where they can start fires. The components shown here are what is known as a Master Mechanic's Front End, an arrangement used on most locomotives in North America. 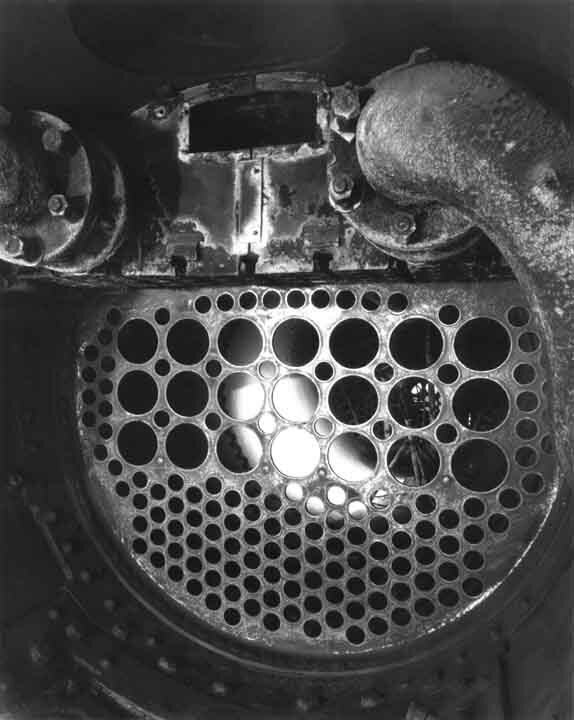 A vertical plate behind the petticoat pipe and a horizontal plate, or table, level with the top of the blast pipe force the exhaust gases to the front of the smoke box where they slow down enough for most of the solid matter to fall out and collect in the bottom of the smoke box where they can later be cleaned out. (On some locomotives that worked in districts with certain grades of coal, the smoke box was of an extended design so that it could hold more cinders.) From the lower front, the exhaust then passed through a large screen that sloped down from the top front of the smoke box to the table at the top of the blast pipe. 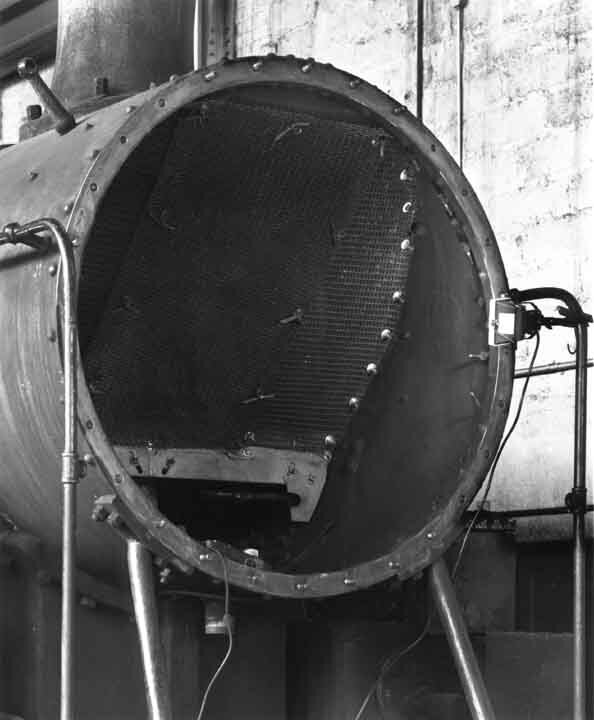 This screen served as a spark arrester. You can see all these parts in the photographs, but there is more there as well. What's that all about? Steam from the boiler must take some path to get to the cylinders and part of this path is through the smoke box. 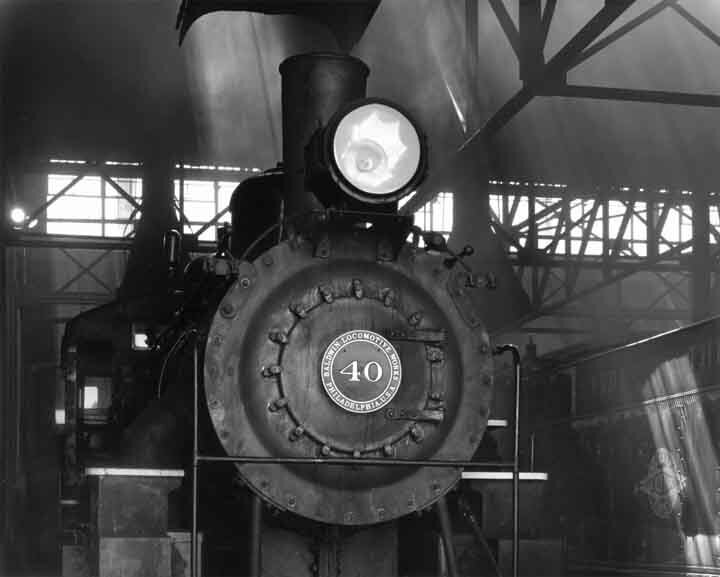 Steam is drawn from the boiler through the throttle valve which, on #40, is mounted in the steam dome, the large dome a little more than half ways back on the top of the boiler. From the throttle, the steam goes through the dry pipe, a pipe inside the top of the boiler that exits the main boiler courses at the front tube sheet. 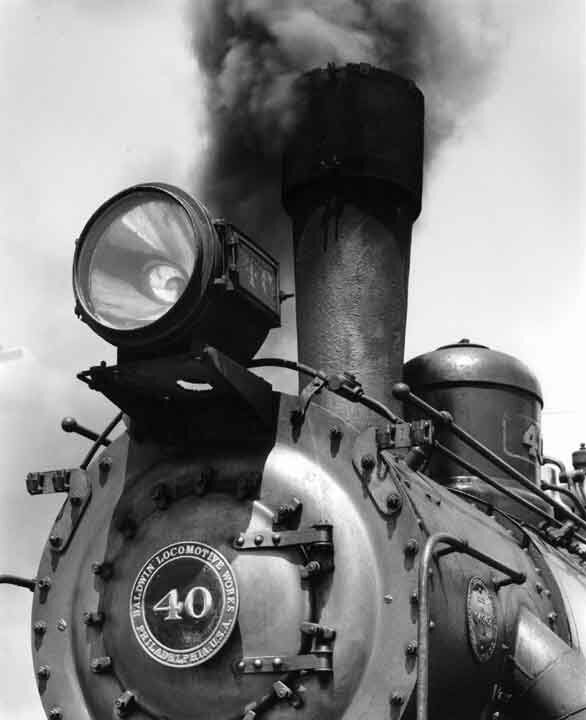 Originally on #40, the dry pipe was connected directly to the two branch pipes which curved down and around the inside of the smoke box joining to the cylinder saddle at a point just to the left and right of the blast pipe. In one of the photos you can see where this later connections were stubbed off. #40 was originally built to run on saturated steam but was later converted to use superheated steam and many of the changes took place in the smoke box. With super heating, steam passes through a series of pipes which loop back and forth inside oversized boiler tubes, better known as flues. The exhaust gases there super heat the steam taking it from boiling temperature, around 380 degrees at working pressure, up to around 700degrees. This expands the steam giving it the capacity to do more work. One of the photos shows the superheater bundles on the shop floor while two others show them installed. 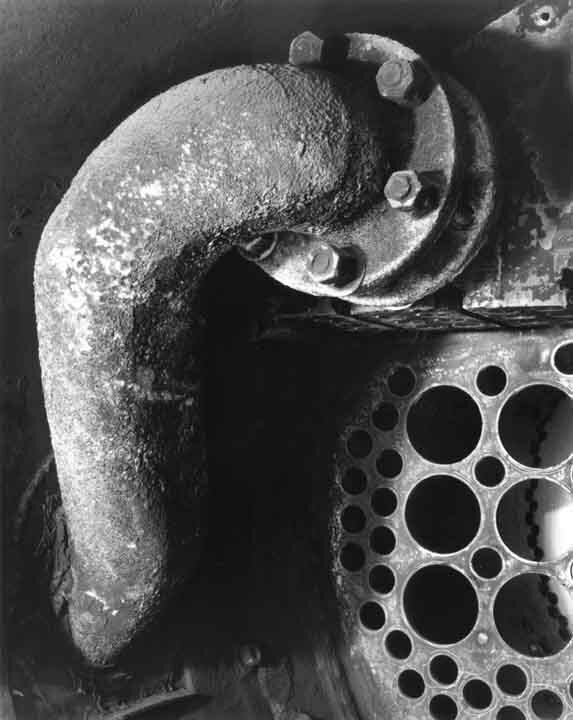 In the conversion, the original tube sheets, which had all holes of the same small size, were replaced with new sheets with holes of the two sizes for standard tubes and the larger flues. At the end of the dry pipe the superheater header was installed. 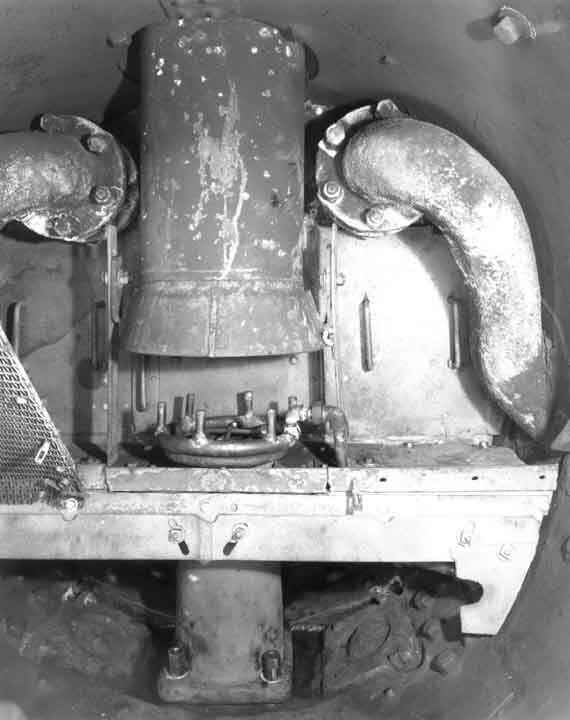 This block like affair is where the individual super heater pipes are connected to a series of interlocking passages, one group from the dry pipe the other to the branch pipes. New branch pipes were also installed that ran from the header, curving down the inside of the smoke box and then passing out through the sides and then down to the steam chests above the cylinders. Note that when re-tubing a boiler, it is rarely necessary to remove the super heater header or the dry pipes. The final thing in the smoke box is the blower. If the locomotive is not at work and there is no exhaust steam, a way still needs to exist to induce the draft. For this live steam from the boiler is injected directly up into the petticoat pipe, in this case by six nozzles attached to a ring around the end of the blast pipe. This steam is supplied from a valve mounted in the cab and operated by the fireman. The inside of the smoke box is a hellish environment. While much of the heat of the fire and exhaust gases have been absorbed by the boiler, the exhaust gases are still very hot. In the smoke box, unlike the pressure parts of the boiler, there is no water on the other side of the metal plates to absorb the heat. In steam days there were no paints which could withstand these temperatures and the outside of the smoke box was painted with a mixture of graphite and oil. The author has heard stories where hard working helper locomotives, pushing behind a caboose, were observed to have the lower smoke box front glow red hot. Imagine what it must be like for the components inside the smoke box, particularly the baffle plates and spark arrester which don't have steam passing through them. The atmosphere in the smoke box is also a very corrosive one. The ash and cinders, combined with moisture from the steam are acidic. Add heat to that and even steel won't last forever. Some locomotives wore patches welded to their lower smoke box fronts. On the inside, the bottom of the smoke box where ash and cinder accumulated (sand from sanding the flues on oil burners), would get an eroded appearance. If things got bad enough, the complete smoke box would need to be replaced. Most of the components described above can be readily identified in the photographs, but a few things are worth pointing out. In the image "#40's Tubes and Flues," we see the tubes in the process of being removed from the boiler and the larger flues stacked on the shop floor. Note the scale on the tubes and flues, this is a residue left over from boiling the water. Most of this residue is held in suspension by special chemicals or boiler treatment and blown out when the boiler is blown down. Some of this sediment is washed out during periodic boiler washes, but some adherers to the inside of the boiler as we see here. It reduces the thermal efficiency of the boiler and if it gets too thick can lead to tubes or side sheets of the boiler getting too hot and eventually cracking. 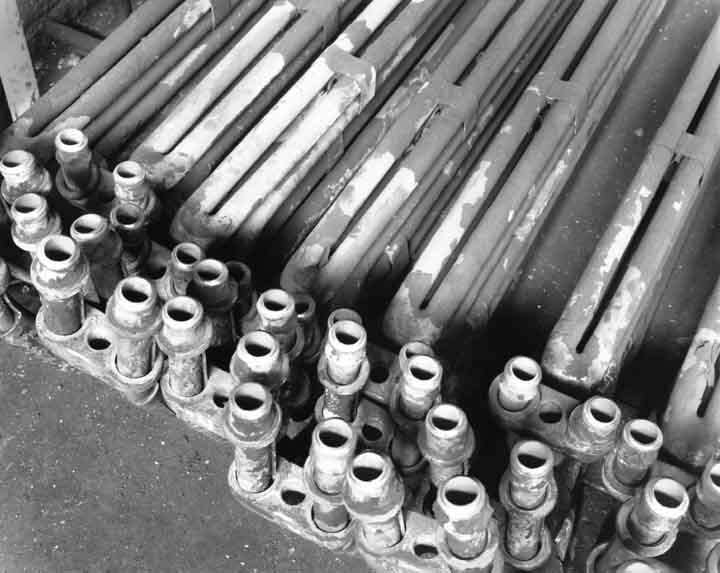 In "Superheater," note that all the tubes and flues have been installed and their ends can just be seen where they have been "rolled" into the tube sheet. In the Photos "Tube Sheet" and "Branch Pipe" the tube sheet can be seen without the tubes installed, but prep work has been done for their installation. 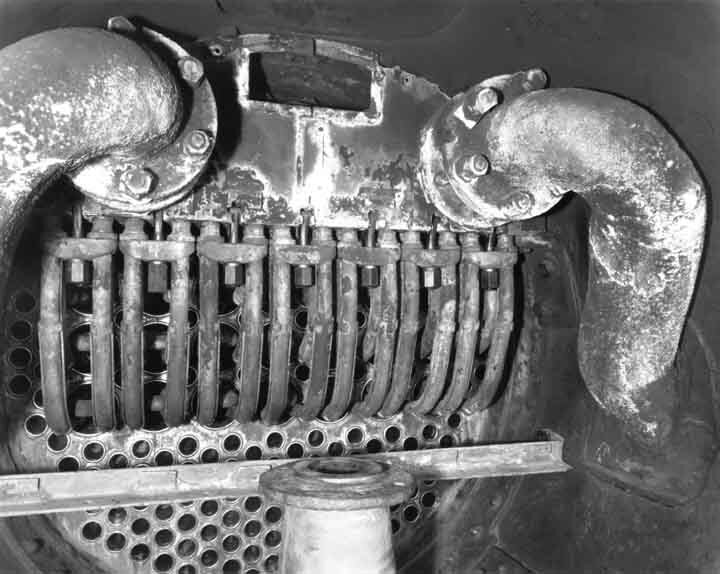 Also note the "T" slots in the superheater header and the special nuts used to cinch up the superheater bundles. In "Tube Sheet," we can see the superheater header at the top of the photo and a branch pipe on the right. Both of the branch pipe mounting flanges are prominent at the top. The hole at the top will receive a cover plate. The original plate could not be found and a new one was cut and drilled from a piece of scrap steel plate. Looking through the holes in the tube sheet, we can see a tripod on which is mounted a work light and an access ladder that has been extended down from the open steam dome cover. The work light has illuminated the inside of the main boiler courses and a double row of rivets joining two courses can be seen. 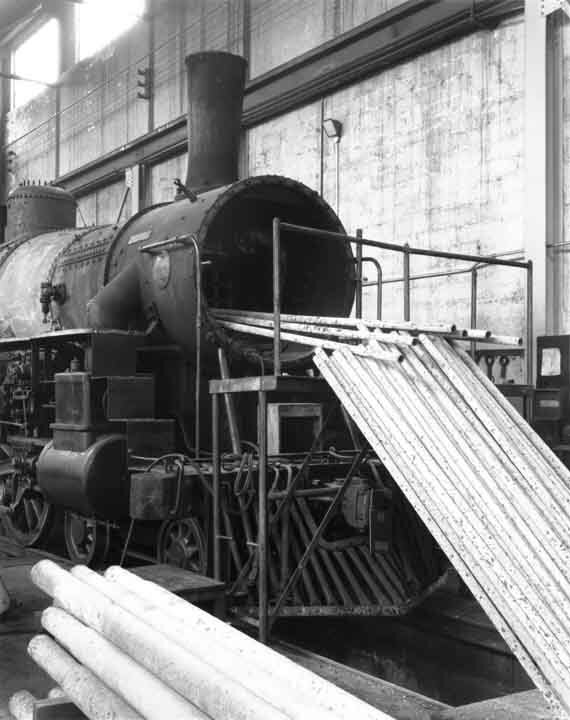 Towards the rear, the rear tube sheet with its holes can be seen and even some of the staybolts around the firebox are visible. Finally we can see out the rear of the firebox through the open firebox door. During the final assembly the shop crew was generous enough to let me take the time needed to setup my view camera on #40's pilot deck and make these time exposures. Dressed for the occasion, I repaid the favor by then climbing in, wrench in hand, and proceeded to get as dirty as everyone else. Click here to send coments.